The few privileged enough to have a medical insurance cover have some cushioning, but it’s never enough. Kenyans who have no choice about seeking treatment for illnesses or injuries often end up having to sell off prized property to foot their bills. As debate rages on whether doctors' fees should be reduced it's a sad story for patients countrywide who have had to stay away from hospital or pay an arm and a leg to access healthcare. 27-year-old Moses Karonei has been bed-ridden in hospital for two years, nursing severe injuries that paralysed him following a road accident near Kipsitet trading centre on the Kericho-Kisumu highway. Other than the excruciating pain and immobility that has confined him to his ward bed, the Information Communication and Technology (ICT) expert is deeply worried about the growing hospital bill, which has now hit Sh7 million. Coming from a humble background, Mr Karonei, who was newly employed at the time, was his family’s hope. The unfortunate incident dealt a blow to his parents, who had to sell a portion of the family land to raise part of his medical fees after his insurance company refused to foot the bill. Mr Karonei, who is a resident of Tinderet constituency in Nandi county, narrated what happened after he was knocked down by a speeding car while riding a motorcycle from Muhoroni Sugar Company where he worked. He was first admitted at Siloam Hospital in Kericho County on December 15, 2016. “Everything happened so fast. I was rushed to hospital unconscious. I remained in a coma for close to three months,” he said. At Siloam Hospital, Mr Karonei was immediately taken to theatre for reconstructive surgery which lasted 13 hours. Dr Patson Kubuta, a resident doctor, said that the patient had extensive tissue loss, especially from the left elbow and on the lower back, and multiple deep lacerations on the head and face. He added that Mr Karonei had been taken to theatre for multiple surgical debridements, daily wound cleaning and dressing, and physiotherapy sessions. “Cervical spine X-ray and CT scans showed a burst fracture of the C-5, with a spinal compression of the same segment, leading to paralysis of both upper and lower limbs. Now he is unable to walk,” said Dr. Kubuta, who added that the patient had also suffered a wrist drop on the left hand. By the time he left Siloam Hospital in December 2017, Mr Karonei had accrued a bill of Sh3 million. Multiple fundraisers organised by his parents, relatives, friends and well-wishers offset slightly over half of the amount, and he promised the hospital that he would pay the rest in a year. He was moved to Memorial Hospital in Eldoret where he underwent more surgeries. “I had corrective, reconstructive and plastic surgeries to seal off a wound at the back, and a broken hand. I now use a motorised wheelchair,” he said. Mr Karonei now has to undergo physiotherapy to help him out of the partial paralysis that confines him to a wheelchair, but the rising cost of medical fees frightens him. He has rented a house close to the hospital to avoid spending money on a ward bed. He visits the hospital for his appointments every other day. “I am hopeful that one day, my life will return to normal so I can advance my career and offset the huge medical debts that give my family sleepless nights,” said Mr Karonei. Lydia Wangui, 39 and a mother of seven, was knocked down by a boda boda rider on March 17, 2017. 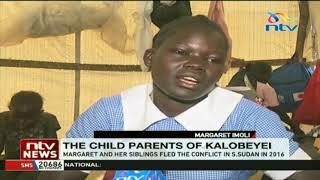 On that fateful day, Wangui, a resident of Gatei village in Gatundu North, had joined her husband Simon Njoroge in taking a walk to a nearby shopping centre to run a few errands. She was hit by a rogue bodaboda operator who sped off and is yet to be found. The accident left her with a severely broken leg. Immediately after the accident, her husband and well wishers rushed her to Igegania Hospital for first aid, from where she was transferred to AIC Kijabe Hospital for further treatment. "My injury was severe. I was admitted at AIC Kijabe Hospital that night, all the way through to May 2017," she recalled. That year alone, Wangui underwent two operations to repair her badly broken leg. She was discharged in May but was required to attend bi-weekly clinic visits which her husband, a casual labourer and the sole family breadwinner, strained to facilitate. "Each appointment cost Sh600 and since I couldn't travel in a matatu, it cost us Sh5,000 to hire a taxi every fortnight between May and December 2017," her husband told Nation. In that year, the family conducted a fundraiser to offset the bills and raised a little over Sh500,000 — but the funds did not cater for the entire bill. A balance of Sh76,555 remained, and a neighbour offered her title deed as collateral to secure Wangui's release from hospital. The neighbour was later forced to borrow money from her bank to settle the balance in order to get her title deed back after a pressing financial need arose. "She (neighbour) needed to raise school fees for her child and that's why she needed the title deed back. But to get it, she had to pay up the balance that the document acted as security for. We still owe her the money she paid," Njoroge explained. Last year alone, Wangui was operated on three more times and on June 26, she was readmitted to the same hospital until October 1 when the hospital discharged her. This time, Wangui had registered for the National Hospital Insurance Fund (NHIF) but her bills accrued to Sh897,000 and unable to pay to secure her release, she was detained at the hospital from October 2018 to January 7, 2019. Her bill shot by Sh3,500 for every day she spent at the hospital. The family sought for help and with the assistance of their assistant chief Mr Peter Muya, managed to get Sh50,000 from NHIF which slightly reduced the bill, which currently stands at Sh1,088,000. The couple's children have since stopped attending school due to the financial constraints. The young family has depleted all its resources and though shy of conducting a second fundraiser, remains hopeful that well-wishers will come through for them. On Monday this week, Wangui was discharged from hospital after a well-wisher who was visiting his sister at the hospital saw her, learnt of her misfortune and offered his title deed as security. "My release from hospital came as a surprise and from a person who knew me from home. After informing him of my predicament, he promised to follow through with my husband and on January 5, he brought his title deed to the hospital. On January 7, my husband brought me home," said Wangui who is expected to resume her fortnightly medical appointments next week. There is little hope the average Kenyan can afford medical care. This is due to the fact that the country is yet to operationalise the much-touted Universal Health Coverage. A visit to a general practitioner will ordinarily set you back Sh2,000 for consultation, and God knows how much one will spend should the doctor request tests be carried out. X-rays or CT-scans will not be less than Sh4,000. A high-resolution CT-scan is charged at Sh23,000, and in some cases, much more. If one should require to visit a specialist, consultation varies from Sh4,000 to Sh5,000 depending on the hospital. After that, a visit to the pharmacy will set you back no less than Sh6,000. I have witnessed patients at the pharmacy attempting to knock off the drugs they consider ‘‘not too important’’ because of the cost involved. In total, one visit can total upwards of Sh20,000. It’s buying one’s health. But this is not to say the insurance firms roll over for you when you make your payments, nay, in some cases, it takes many phone calls and lots of frustration to get someone on the line to give you the assistance required. Ngilu says Kitui residents, especially the needy, will no longer have to choose between food and medical care.